Roesch Manufacturing has been making precision machined products for over 60 years. Our products are used in many different industries and business sizes from large OEMs to mid-sized service centers, to small businesses. We offer standard products made to common designs and custom products made to your individual specifications. Contact us today and we will gladly assist you with your product requirements. Standard Products - Our company manufactures many different collets, collet chucks, and other tool holding products for the power tool and machine tool industries. These products are made from high quality materials, to common designs, and are carefully inspected to industry standards. Many of our products are also available from stock for next day delivery. If you are involved with the manufacturing or servicing of industrial power tools, contact Roesch Manufacturing Company for your tooling needs. Custom Products - Contract Machining - In addition to our standard tooling products, our company also performs contract machining for other industries. We have the capability to produce high quality component parts that are used in many different products. Our additional services also make Roesch Manufacturing Company a convenient and cost effective one stop supplier. 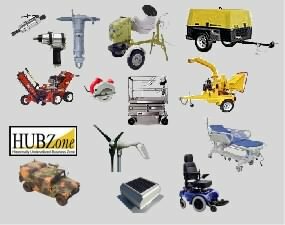 Listed below are a few of the industries served and products we can produce. Contact Roesch Manufacturing Company for a quotation on your next project. Construction & Power Equipment - Our specialty. From stationary and hand-held power tools to specialized construction or landscaping equipment, contact us for your precision machined component parts. Defense & Government Products - If you need bolts, pins, hubs, fittings, brackets, or any other small machined component, let us help you. We are registered with the CCR and are a HUBZone certified supplier by the Small Business Administration. Health Care & Medical - Pins, special fasteners, and articulated motion products made from corrosion resistant materials are products we can make for you. Alternative Energy - While we do not make solar panels or wind turbines, we do make small machined components that help turn these new technologies into complete assembled products.